There was an unashamed call to mass mobilisation against the Zuma regime at recently deceased struggle hero, Ahmed Kathradaâ€™s memorial service. 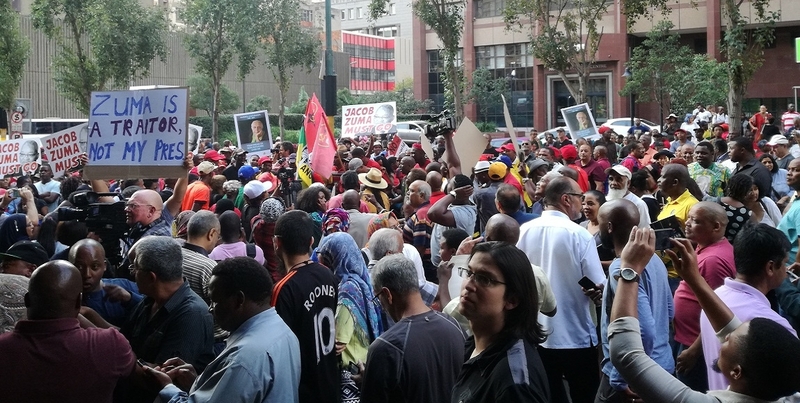 Hundreds gathered at the Johannesburg City Hall on Saturday afternoon for Uncle Kathyâ€™s politically inciting memorial service. The memorial service took place just days after President Jacob Zumaâ€™s controversial cabinet reshuffle, where he axed five ministers and reshuffled several more. The atmosphere at the memorial was charged, struggle songs peppered with â€œPhantsi Zuma” and thunderous applause reverberated through the hall. According to Gordhan, a number of the ruling partyâ€™s top leadership were unaware of the cabinet reshuffle. Gordhan urged the crowd to ask themselves what the young and revolutionary Kathrada would have done. He said that Kathrada would have said that it was time for the people to unite against the weaknesses in the movement. Gordhan was clear that the ANC and South Africaâ€™s democracy are in a â€œmini crisisâ€ and that South Africans should unite to hold government accountable. Kathradaâ€™s widow and struggle stalwart in her own right, Barbara Hogan, also called for Zuma to step down and lambasted his current government, saying that Zuma had sacrificed everything the ANC stood for. Neeshan Balton, the director of the Ahmed Kathrada Foundation, also called for various South African movements to mobilise against the current government. The memorial service was held by the Ahmed Kathrada Foundation, the South African Communist Party (SACP) and the Gauteng ANC. The Gauteng ANC joined in at the last minute after the government postponed the official memorial service for Kathrada indefinitely. The state memorial was supposed to be held in Soweto on Saturday, with Cyril Ramaphosa giving the address. According to government communications, the state cancelled the memorial service because it could not come to agreement with the family. Zuma did not attend the funeral on Wednesday and would not have attended the memorial service either in compliance with the wishes of the Kathrada family. Why must we take to the streets to fight internal ANC battles?